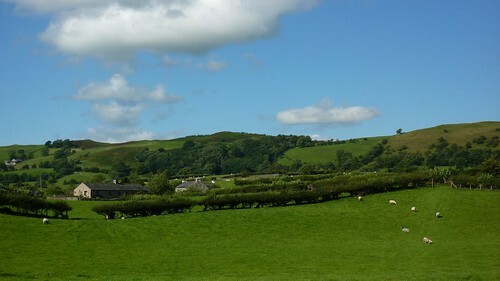 Where the man in the boots sees the Howgills (how nice) and some farms. And bridges. And sheep. In fact it’s all a bit like the rest of it really. “So how did you find today,” asked the warden at Kendal youth hostel. Given I’d arrived just after 5:30 and was looking distinctly able bodied with no flashing blue lights greeting my arrival, I think it’s fair to say that I’d made it reasonably well. That’s not to say I hadn’t got lost, but my idea of an inadvertent detour turned out to be probably no more than a quarter of a mile, and I’d stumbled on the right path in the end. In the grand scheme of things, I’d clearly done all right. However he wasn’t wrong when he said people found the stretch from Sedbergh tricky. From a navigation point of view, the day had been a nightmare and I spent most of it cursing the inadequacies of the route signage, the awful state of the instructional text in my guidebook and the uselessness of the Ordnance Survey maps they’d included in said guidebook. Now I love Ordnance Survey maps. They are a beautiful thing to behold. If you’re using the 1:25,000 scale maps anyway. But the guidebook, well the maps they’d used were terrible. For starters they’d only included a thin strip of map along the Dales Way which was all very well if you knew where you were however was no help at all if you wanted to know whether that farm in the vague distance was the one you should be heading to the left of, or not. Now I did have proper maps at the much bigger 1:25,000 scale in my rucksack however annoyingly the four I had didn’t cover two thirds of day five’s walking – a fact that had seemed fine when I’d been planning the trip cos, you know, there’s maps in the book… But having spent all day wandering around trying to work out which of three paths next to a river I should be taking, just ended up being highly annoying. To be fair, things didn’t start off particularly badly. With the mighty Howgills dominating the skyline for most of the day, the trip out of Sedbergh had been very straightforward following paths that stayed near to the River Rawthey as it tumbled downstream. After passing the first of three defunct railway structures in the form of a bridge at Brigflatt’s, and a brief diversion down the side of the horrendously busy and pavement-less A683, I was heading through the first of many fields and farms before being dropped off at Lincoln’s Inn Bridge, so named after a Mr Lincoln who owned the Inn before the bridge was built. Travellers and drovers would pop in for refreshment until they could safely ford the busy river. The pub no longer exists – it’s now a farm – and no doubt the bridge was a factor in its demise. Passing the bridge it was now time to head down another dale – Lonsdale this time – via a glorious trip under Lune Viaduct. Like the bridge at Brigflatt’s I’d passed earlier, Lune Viaduct was part of the Ingleton to Tebay branch line, and after many years of loyal service it fell until the inevitable axe of the infamous Doctor Beeching. Standing high above the ground, it must have once provided passengers with a fine view of the area, however now it sat forlorn and unloved, access to the former line now blocked by huge metal barriers. The fine views of the Howgills and beyond were prevented from being seen. In many places, such defunct railway lines had found new lives as cycle paths and walkways and so could this one if someone would just give it the break it needs. Getting down from my soapbox I continued on through the fields, and near the Crook of Lune bridge I passed through a patch of riverside chocked full of wild flowers; butterflies fluttered happily between them. 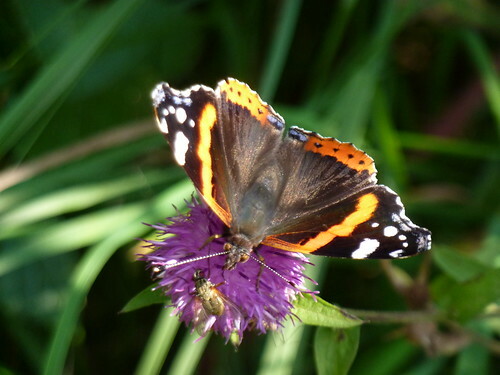 A Red Admiral in particular seemed amazingly photogenic and was more than content to let me snap away at it with my camera. “Burneside” I replied as truthfully, which is the only way you can reply when there’s bullets around. Was I supposed to? Was it compulsory? Maybe he liked to shoot them. “No, just a lot of butterflies.” Red Admirals and everything. “Ah, there’s a lot down there. I meant to get a chart with them all on – had the coupons from the newspaper all cut out, only I forgot to send them off in time. Oh well,” he said, rather wistfully, before heading off to shoot some coneys or whatever he was going to do. 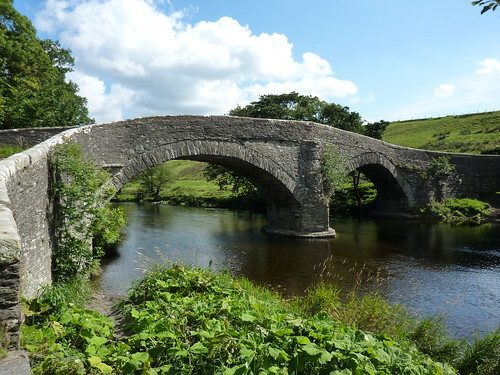 I never did hear any gunfire ringing through the valley so I guess he didn’t find a brace, and I did linger in the area for quite some time after finding a nice spot to rest and eat my lunch near the ancient but pleasingly shaped double arches of Crook of Lune bridge. You see a lot of bridges on the Dales Way. Something to do with river walking, and it can either make you blazé or turn you into a bit of a connoisseur. I’d fallen firmly into the latter, admiring their stone work and the way most of them seemed far too small and impractical for the modern car obsessed age. However their slender frames were perfect for the ambling walker and the pootling minor traffic that used them. The Crook of Lune bridge was a fine example of the time, seemingly even more delightful as its peace and tranquillity contended with the thundering noise of the nearby M6. The bridge also marked a change of administration, being on the boundary of the Yorkshire Dales National Park and I crossed over, leaving the park that had been with me for so many days behind. 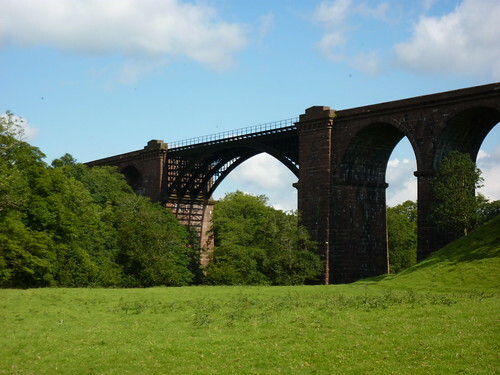 Almost as soon as I’d left it, the noise of the M6 ratcheted up a notch and became visible through the arches of the mighty Low Gill viaduct stretching across the valley, and certainly the finest of the stone built and sadly defunct railway structures I’d seen that day. So far route finding has been relatively simple – a case of following some signs and crossing the odd stile, however now things took a more complicated turn as the path twisted over faint paths, and turned abruptly through farmyards. Crossing over the motorway, signs seemed to disappear and the uselessness of the small scale maps in my guidebook gave little clue. I had little idea of where I needed to go. All I knew was that I needed to cross the West Coast Mainline which was clearly visible as it threaded its way along at the bottom of the hill. Prominent on the landscape was a large, green metal footbridge spanning the line however my path was going in completely the opposite direction, and to make things worse, all of a sudden my guidebook’s instructions started making no sense to me at all. At a junction of paths I spied several routes, none signposted. The instructions proclaimed I shouldn’t take the obvious one, but a completely indistinct one instead. Each one seemed to fit the bill perfectly. Becoming completely convinced that I was in the wrong place, I headed off route to the bottom of a field where the bridge seemed tormentingly close, however there was no stile at the bottom, and no clear way out of the field bar scrambling over a fence. Wondering whether just to climb over it, I touched a wire and immediately got a shock. The fence didn’t proclaim to be electric, but something certainly jolted me. Perturbed I wandered on along the field boundary, desperately wondering where I was. At a point shallow enough, I jumped over the fence and headed into a neighbouring field and gently uphill, taking me further away from the promise of the green bridge. My book, oblivious to my plight, showed none of this and in the end it was a sheer accident that I stumbled upon a path and decided to follow it. A signpost a short while later put me in a better frame of mind. By sheer chance, I’d stumbled back on to the Dales Way, and finally the instructions in my guidebook began to make sense once more after I realised I’d ended up on completely the wrong page. All was now well, however such mishaps were to be a recurring theme for the rest of the day. Eventually I did find myself crossing over the railway, and only about two miles further on from the promised land of the green bridge which, it turned out, wasn’t even mentioned on the maps in my guidebook. 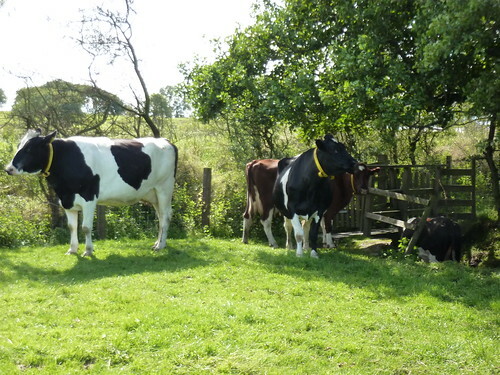 Nor was the footbridge I crossed next, which featured guards in the form of several large cows which had that infuriating affliction that affects many farm animals. You know the one. The one where, in a large field with loads of space, the most interesting bit is the small section where you want to go. Cows. Yes, well cows. Hitchcock didn’t write the seminal thriller classic “The Cows” but then he probably never met the bovines of this part of Cumbria. For some time I’d been looking for a spot to rest and, far more importantly, eat a chocolate brownie which had been burning a whole in my pocket ever since I’d bought it in Sedbergh that morning. Finally I located a passable looking place next to the wonderfully named River Mint. By far the best spot was on the other side of the river, on its gently sloped bank, however as that field was rather full of beefy goodness, I opted instead to perch in the corner of the field just before the bridge. As I stood munching my brownie, I happened to look across straight into the eyes of a few cows who were watching me with interest. Looking up once more after temporarily heading back to my brownie, some more had arrived. Before I knew it most of the herd was lined up on the opposite bank, chewing away whilst barely moving their eyes off me. If that wasn’t intimidating enough, the sight in the corner of my eyes really perturbed me as I watched a steady stream of animals now fording the river to pass close to me. Okay, to be fair, they weren’t crossing the shallow water to get closer to me (and my brownie) but to get to another field on my side, however it took me far too long to realise that, and for a moment it was all rather worrying. 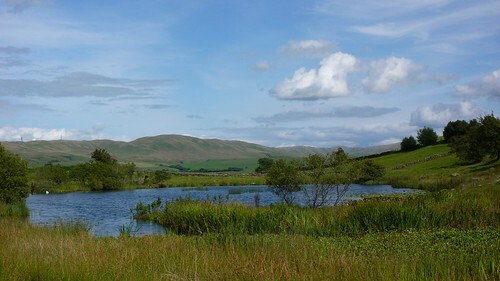 I now headed to Black Moss Tarn, a delightful patch of water sadly surrounded by the necessary evil of pylons, and promptly got lost once more after making the mistake of following an obvious path rather than randomly careering down the hillside like I apparently should have done. A few more farms and a main road crossed, and I was almost in Burneside, having finally yet sadly left behind the Howgill fell range which had dominated my views for most of the day. I crossed the busy and appropriately named River Sprint, admired from a distance the half ruined Burneside Manor and dipped down to Burneside proper. Dominated by a paper mill, I hadn’t found many places to stay in the village bar its pub which looked warm and welcoming as I passed its doors. Instead I’d booked myself in at the youth hostel in Kendal. My plan was to catch the train down to Kendal although spotting several bus stops I did wonder if there was a road based option to make the short trip which would have been useful as I was rather too early for the train, but as so often happens, no one had bothered to put up any timetables. If Kendal youth hostel had a doomed feel about it, I didn’t notice even if the warden was talking to a handyman about whether it was worth repairing one of the toilets. Just a few months before the YHA had surprised the local community by declaring that the hostel would be shutting down that September, although by the time I visited it, it had received a stay of execution until at least Christmas and the organisation met local MPs to proclaim they were now looking for new premises. Either way it made the plaque outside the building, unveiled by Princess Anne and commemorating the uniqueness of having an arts centre and a hostel on the same site, ring rather hollow. The hostel didn’t do evening meals so after a much needed and very refreshing shower, I headed out to see the local sights which, based on my walk from the station – included a lingerie retailer specialising in corsetry, several cheap looking pound shops, a seller of tombstones and a Quaker quilt exhibition. This was clearly a place with everything, and I resolved to buy my new corset in the morning and snuggle down under a quilt to plan my tombstone. And maybe buy some washing powder or chewing gum or something. In the end I ended up dining in the local Wetherspoons for no particularly good reason other than that the warden at the hostel (hello Pete!) had mentioned it was curry night and frankly, after days of pub food, I fancied a curry. It was a remarkable pub and perhaps the only one in the land which had a queuing system rather than everyone piling up at the bar and the staff trying to keep track of everyone. Not that it was a deliberate policy given the infuriated way the staff kept calling out for people to come and be served, and which felt like I was in a Post Office rather than a public house. If a booming voice had cried out “Server number three please!” it wouldn’t have seemed that much out of place. It was the layout of the building that seemed mostly to blame for this distinctly un-British way of behaving. Entering the pub, there was a large hall-like seating area on the right of the entrance, with a long, narrow room on the left containing the bar. The bar was slightly lower down than the entrance, but had a ramp for wheelchairs. The position of the railings on the ramp seemed perfectly positioned at the end of the bar in such a way that people naturally wanted to queue next to it. There were only a handful of seats beyond, so if you were stood there, you were clearly waiting to be served. And if one person queued… well others were sure to follow. Especially on a busy night like curry night. And curry night in Kendal’s Wetherspoons was clearly the place to be. By the time I’d polished off my King Prawn curry and pint and was contemplating further liquid refreshment and maybe, well, some dessert, the queue was almost out of the door and not moving fast. Even my desire for good ale (the Hawkshead Red was excellent) and “Eli’s Vanilla Cheesecake” wasn’t enough to cope with standing in line next to my table, so I gave up and headed back to the YHA. Back at the hostel I chewed the fat some more with Pete the warden who, it transpired, was very interested in archaeology and beer served at room temperature (and after once drinking some bottles of Hesket Newmarket’s ales served almost ice cold at YHA Keswick where they lost half their flavour, I was more than happy to drink the same beers a little warmer) and who told me some very useful and interesting information on how I could easily get to YHA Windermere the next day. It was information even the government run Transport Direct website couldn’t tell me, although what it was, well that you’ll just have to wait to find out. First Published: 17 January 2011. Last Updated: 24 December 2018.